Still Moments is a touring exhibition by tapestry weaver Hillu Liebelt. I saw this intriguing exhibition when it visited Bankside Museum in Halifax. It is now opening at Select 2013 at SIT’s wonderful textile festival at Stroud in the beautiful Cotswolds. This is one of two posts I’m making about the artists featured at Select. The second will feature Seiko Kinoshita’s specially commissioned installation and a visit I made to her Sheffield studio in January 2013 just as she was preparing to weave the paper pieces that make The Colour of Summer. 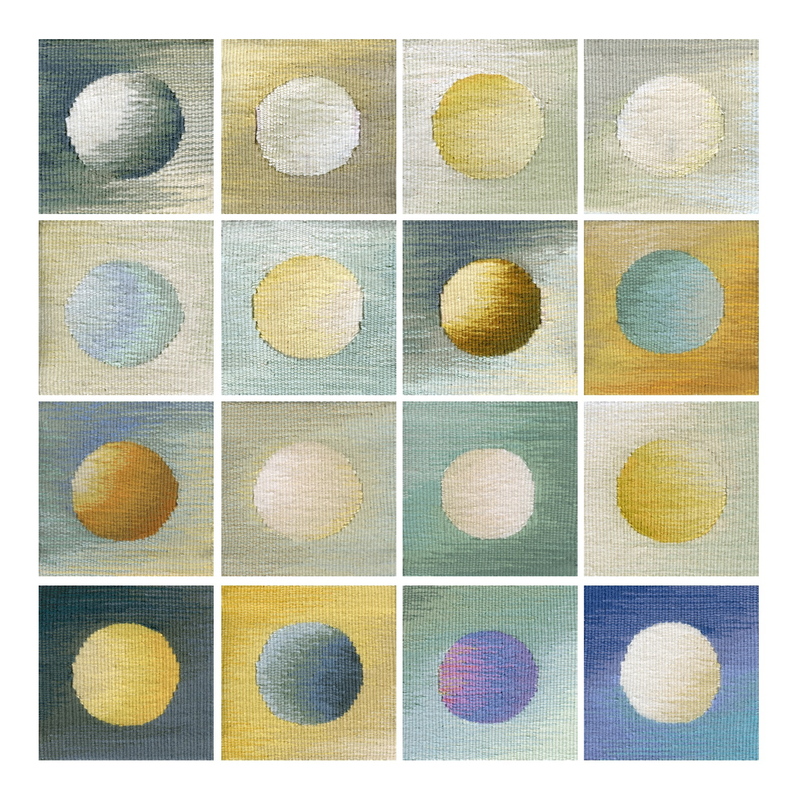 I’m looking at one of twenty 8 x 8cm weavings called Winter Sun. It’s a winter’s day in the third week of December and the series, conveniently placed so that I can look comfortably at it from just a dozen centimetres distant, has been arranged close to large floor to ceiling windows. But alas, there is no winter sun today, just a grey light diffused through a fine mist. Yet all these woven images display an extraordinary textural play of shading and shadow, hardly imaginable as a process of thread between thread. Whilst some of these suns are believably visible, many might belong to other planets sailing in far-distant solar space. The imagination’s prerogative, these images imparting defused light and colour, have an elegant simplicity that is playfully reflective. You look for a favourite, and do so with that intensity and patience Jeanette Winterson has written of so powerfully, where the still but questing eye senses then reveals detail upon more detail. And when you eventually turn away the memory retains the stillness of these moments spent entering their fantasies of colour and texture. This is where I began to engage with the multi-faceted textile world of Hillu Liebert, a world where the technical discipline and steady patience of tapestry extends into related forms of constructed and sculptural textiles. Her touring exhibition Still Moments is poised like a balance, on one end rests the restrained, delicate, sometimes illusory, often complex, often contemplative, the colours of autumn and winter; on the other end placed in equilibrium are vibrant tones and bold patterning, brave constructions, the large-scale, the shock of unusual tonal combinations, the colours of spring and summer. Although the balance is undeniably present there are linkages and dialogues between colours, textures and forms, between the seemingly flat surface of the wall-bound textile and the spatial freedom of multi-dimensional work. There are pieces so placed like Silent Dialogue that the viewer looks upon down from above, an aerial view. Another English Summer 2012 (a little Yorkshire humour here perhaps?) extends the view skyward. For most who visit this work there is likely to be a lively confrontation with material. The predominance of viscose rayon gives much of the tapestry-related work a rare glimmer and glitter to gentler colours, a hard sheen and shimmer to the stronger colours. This is amplified variously by brushed stainless steel and enamelled copper wire, given depth and softer texture by yarns of paper, horsehair and wool, and silk. There is the hot arrow-like velocity of Chasing the Summer placed as far away as possible from cold, ice-like yet vaporizing clouds forms of Long Dream 1 & 11, the dark pools and metallic traceries of Midnight Blues. In this exhibition we enter into the artist’s engagement and a very oriental preoccupation with space. It would seem that each fashioned object contains an individual spatial characteristic that extends beyond itself to claim a territory all its own. Witness the play of shadows of the willow stems in the Winter Light Circle, the dominant centrality in the exhibition of Red Circle, the illusory nature of Into the Unknown that creates on a flat surface – and at a right distance – powerful 2-D images. Each and more requires a ‘best position’ or ‘right fit’ of body and mind. There’s almost a dance of looking to find not just the position, but also the still moment itself. One can almost imagine that the work contains an unspoken koan, that puzzle dialogue, question or statement used in Zen Buddhism to provoke ‘great doubt’ in the student. There is no narrative in this work except your own. It has no story, no programme, it eschews interpretation; it is a gathering together of elemental forms reflected upon in the stillness of the artist’s studio. The camera as Hillu Liebelt’s third eye seems unusually vital as a way of bringing non-verbal clues to the visiting eye and questioning mind. Her photographic images in the exhibition’s catalogue are arresting, as they are beautiful. Of course, we know such sights, only we haven’t always made connections into form. As Herbert Read said of a work of Barbara Hepworth ‘our senses are projected into the form, fill it and partake of its organization … it becomes a mandala, an object which in contemplation confers on the troubled spirit a timeless serenity’. Note: Several of the pieces shown in Still Moments also featured in the artist’s previous solo touring show Delicate Matters (2008-9). This exhibition along with Still Moments has been shown respectively in Katsuyama and Kyoto, Japan. See a short video feature on Delicate Matters and the artist’s residency in Japan here. This entry was posted on April 25, 2013 at 7:52 am and is filed under Uncategorized. You can follow any responses to this entry through the RSS 2.0 feed. You can leave a response, or trackback from your own site.